State pattern, which allows objects to behave in different ways depending on internal state. State is used when you need a class to behave differently, such as performing slightly different computations, based on some arguments passed through to the class. 1. VehicleNotificationStatus – having different status details about vehicle. 2. VehicleStatus interface to evaluate the different statues. 3. Different statues classes to implement the VehicleStatus interface. 4. Now we need to write Factory class which can be implement all this status details. 5. 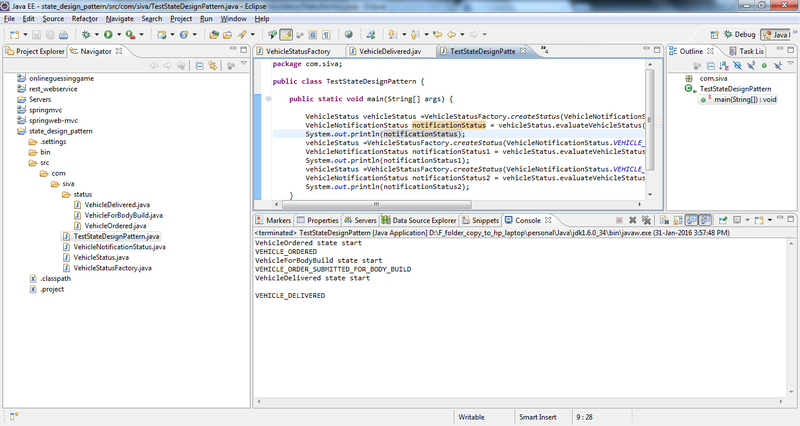 We have completed the all the classes related to State pattern, now we need to write test class to see the results. This is how state pattern will work.